This video probably deserves some kind of introduction, but it’s friday and I’m feeling lazy. Just watch and enjoy! 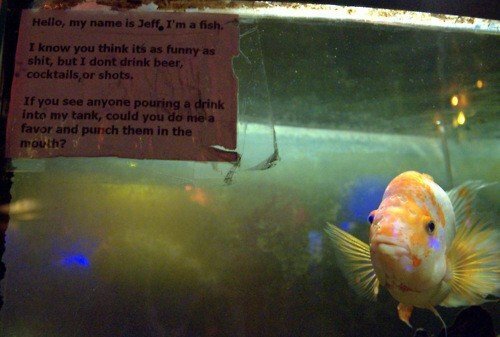 Jeff the fish really doesn’t want your alcohol. Dubai Shark Tank Springs A Leak! 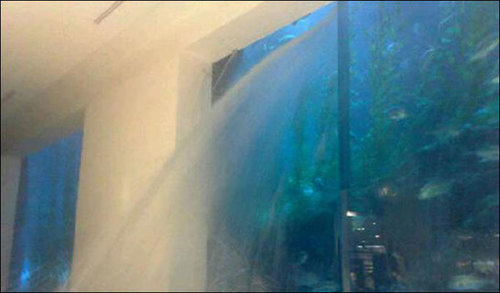 The aquarium in the Dubai mall has sprung a leak! 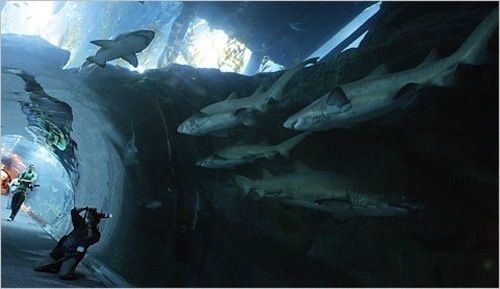 This enormous tank holds 2 million gallons of water and over 33,000 sea creatures. The leak started spraying out sea water into the mall through a crack in the 30″ clear acrylic walls, no idea how the crack happened though. A representative from Dubai’s civil defense force says it’s no under control and being fixed. Why do I get the feeling that once Dubai goes bankrupt it’s going to turn into some kind of Bioshock style wasteland. Well, without all the 20’s flapper and fountainhead undertones..
We’ve covered some pretty awesome aquariums in the past, but this multi-level multi-globe labyrinth aquarium from Optulent Items is just amazing! 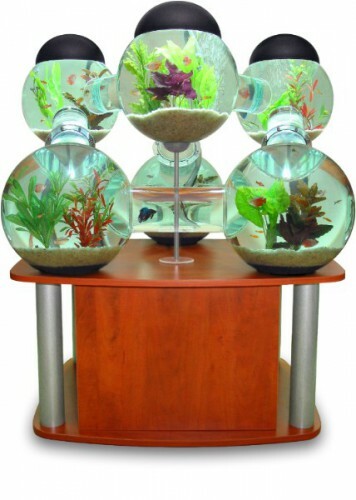 This very innovative and rare aquarium is offered in three colors. The tables are produced in cherry, black or carbon fiber and they conceal the rare filtration and lighting components. Fish swim freely throughout the entire aquarium. Designed for tropical freshwater fish. The table is optional. Filters and all equipment still included if purchased without table. Your aquarium includes silk plants, 3 lights, filters, air pumps and cleaning equipment. The 3 rare lights are doughnut shaped and are placed underneath the black central hoods. They include programmable timer plugs which allow you to set when the lights turn on and off. We set up installation if desired. All that for the low price of $6,500.00 USD, but you get free shipping so why not!